If you’re looking for somewhere a little different to travel, then Madagascar may fit the bill. With no direct flights, it takes a little getting to from London, but the investment is worth your while. 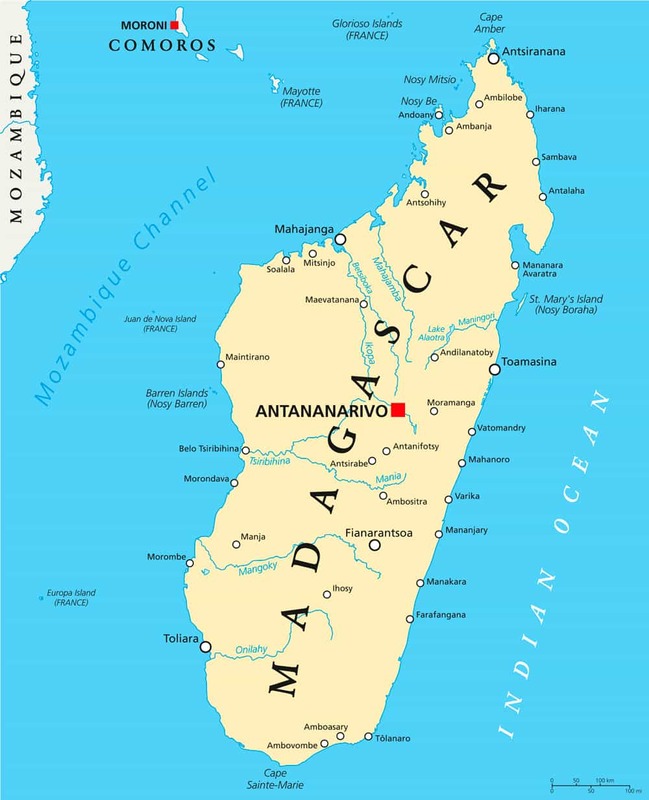 Around 200 million years ago, Madagascar drifted away from Africa making it the fourth largest island in the world, and it now sits 250 miles from Mozambique. The island is covers around 600,000 square kilometres and about the size of Texas, so it is no surprise that the island’s terrain varies from rainforest to desert, and from high plateau to tropical island. It is an island blessed with a wealth of flora and forna, some of which are unique. It is also famous for having been the home of the now extinct, and mysterious looking dodo. Over 200,000 animals and plants have been identified in Madagascar, 150,000 of these are unique to the island. Of these, there are 1000 species of Lemur that are not found anywhere else in the world. The Broad-nosed Gentle Lemur, Red-Bellied Lemur and Woolly Lemur are among the more unusual species. The lemur can be found in the lush tropical forests, that run down the eastern side of the island, along with other extraordinary inhabitants; these forests are certainly worth exploring. Along the west coast, you’ll find the famous Avenue of Baobab trees or upside down trees, standing majestically together along a 260m stretch of road. At the heart of the island is the capital Antannanarivo. Brightly coloured houses cling to hillsides, rice paddies are tended up to the edge of the city, bustling markets sell everything from herbal medicine to semi-precious stones. There is a wonderful simplicity to the place evidenced by the ox carts rumbling along on the outskirts of town. Madagascar is unique with a rich cultural history bringing together influences from East Africa, Arabia, France, China and the UK. Activities include: fantastic birding and wildlife such as whale watching off the coast from June to September, when large pods of humpback whales make their migration; great diving and snorkelling, as Madagascar boasts one of the world’s biggest coral barrier reefs around Ifaty and Mangily; some beautiful beaches like those on Nosy Be archipelago off the north west coast of the island. Unsurprisingly, vanilla figures largely in Malagasy cuisine, which is a unique mix of Arab, African and Indonesian influences. Madagascar is less well developed as a tourist destination, so you need to be a little more diligent about food hygiene and assume, for example, that ice cubes are made with tap water! You won’t find the super luxurious lodges that you find in some private game reserves in Africa, however, the accommodation varies from very high standard to simple and rustic. There are some lovely properties on the beaches and wherever you stay, the welcome is always warm, genuine and friendly.